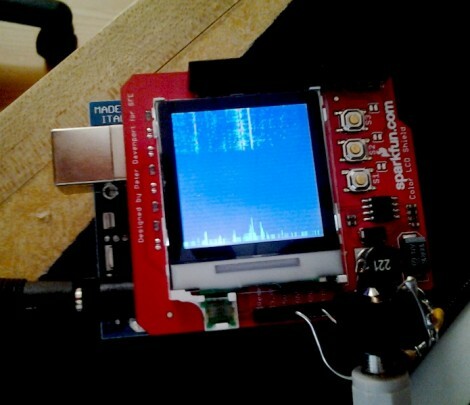 The display he chose is a Nokia LCD shield from SparkFun. It’s easy to plug in and there were already libraries available to drive the display. The audio input just connects to a headphone plug (you can just make it out at the bottom right in the image above) using some electrical tape. A free-formed resistor divider ensures that the signal is within a measurable range. [Leigh] found that signal noise was a bit of a problem but was able to improve his results by adding a capacitor to the Arduino headers between the VREF and GND pins. Always wanted to teach myself FFT… This seems like a useful way to do so. The “Waterfall” software just outputs the direct results of the FFT as pixels. I personally find numbers more useful. Also…he used a pre-made circuit board, with a pre-made shield, with pre-made software libraries…? Super challenging! @M4CGYV3R: waterfalls are useful too. I use them both for digital radio and pro audio. Numbers wouldn’t be very useful in the same use case as the waterfall. The waterfall display is used in Ham Radio digital communication applications to display PSK-32 and RTTY signals, among others. I imagine this project could lead to a full radio receiver if a digital signal decoder was used. @M4CGYV3R: You know, it’s ok to use off-the-shelf hardware. I think we can give him a pass for not mining his own indium to make his LCD panel. This would be perfect sitting on top of an HF rig on field day. @M4CGYV3R: You have a great point. I did this myself in a couple of hours initially, and then refined it over a few weekends. So it’s not super challenging, especially since I’ve shown it works and given some directions. But it’s not a close-ended project. You can reproduce this yourself by buying a few COTS parts and using your junk box, have something that works and is useful, and it just begs to be tinkered with. So what I’d really like is for others to take it in new directions; see the end of my write-up for suggestions. My secret goal is to bring the electronics/uC hacking community and the ham community closer, so I like to do projects that help hams get into microcontroller and real-world hacking, and maybe entice hackers who have experience with things like Arduino and GPS into more RF/radio areas. Thanks for the great writeup Leigh! I’m a EE student and have been interested in RF for a while now, but haven’t made the jump for my ham license or gear yet. I’ve been eying GNU Radio and an USRP from Ettus Research for a while now but I still haven’t made the jump. Could you recommend some good starter gear, or would you go ahead and jump for the USRP? @washer it depends on what you want to do. If you’re happy with what you get out of SDR projects, that’s great. If you want a radio that will work without a computer, that’s good too because you can develop operating skills and gain the practical knowledge and and experience needed to keep up with what your equipment is doing and what it ought to do. In the US, and most of the rest of the world, there are at least two classes of license: one lets you get on VHF and above, and the higher class lets you use HF, which bounces off the ionosphere and goes around the world. So if you start with the first license you are limited to VHF and up, where SDR is much harder due to the higher clock rates and fussier layouts involved. HF is much easier to experiment with. You might consider a digital mode such as PSK31, which can do well with 5 Watts and works well with SDR equipment. Or you might decide to go into VHF/UHF/microwave work and use your SDR with some transverter front ends and try working on 10 GHz, though personally I’d consider that an advanced project. QRP is a fun way to get involved in HF (low power output <5 watts) but it's not so good for developing operating skills, as you need the skill to make contacts first. So save that for a little later. One good option is a digital mode such as PSK31, which you can do with not much power (5W is often enough) on HF, but you'll need the "General" or other equivalent license, which means more theory tests. One thing to beware of if you're outside the US: some license classes don't allow you to build or modify equipment, so you'll definitely need to advanced past the Australian or other "foundation" license. PSK31 is a good digital mode for HF experimentation and it works well with low power (5W or so) and so you can learn a lot with it, and equipment that isn't too expensive. SDR is good with it as well. VHF/UHF with handi-talki or mobile radio will give you some enjoyment but there's not much room for experimentation there, unless you get a radio that does something other than FM (for example, an FT-817) but then you may be searching for others to talk to and experiment with, because VHF is limited in distance, usually. So, HF is good for experimentation and learning, and VHF/UHF FM is good for local communications and meeting other local hams, and VHF/UHF/microwave experimentation is its own highly technical art, and hard to use with SDR or experimental equipment until you get your feet wet. @Leigh thanks for the feedback! I’m definitely looking to get my feet wet and I’ve been thinking more of HF. I’m not too worried about the tests, I am about to get an undergrad degree in electrical and computer engineering and think I should be able to pick up most everything from one of the AARL guides (I’ve taken some digital communications, wireless communications, and dsp classes. Also, I’m in the US, south east). Unfortunately the ham club at my school has been long defunct so I haven’t been able to find an Elmer. One of the things that has kept me from diving in with a USRP is the initial cost. Would a dedicated rig be comparable or cheaper? What would you suggest to start with if I went that route? I know some of the brand names, but not much more than that. I’ll definitely have to look more into PSK31. I have been putting this off for a while. I was thinking I’d get some gear after we finish senior design this fall, but I may make the jump sooner if I have some extra time. @washer why don’t you send me mail when you get a chance. You can use leigh@wa5znu.org address. Shot you an email Leigh. Thanks again.